Attempting to put our past behind us as quickly as possible, TIME has released what they feel are the best inventions of 2008. While there’s some pretty wishy-washy lab-only stuff on the list, we’re glad to see a lot of cool hardware made the cut. Some of our favorites are: The Tesla roadster proving electric cars can be fun. IBM breaking the petaflop barrier with LANL’s Roadrunner. 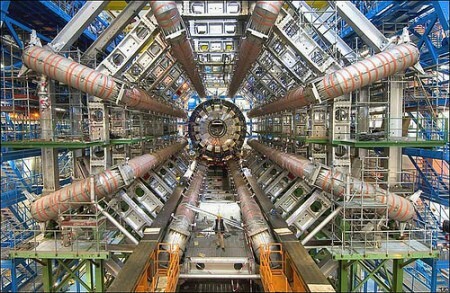 The Large Hadron Collider for getting everyone scared about physics all over again. Have a look at the list for many other tech highlights from this year. The Large Hadron Collider was a success and it didn’t destroy the world. We have to admit, we were a little bit worried about the possibility of generating black holes but were soothed by scientists’ reassurances that we would still exist, and this self-explanatory website. We’re also kind of hoping to build our own. PHD Comics visits CERN to learn all about the experiment. Xkcd prepares for the end times with a new friend. The curious can explore some amazing imagery of the LHC, and read about the best-and-worst-case scenarios, and what scientists are hoping for, or monitor progress via webcam. The celebratory will listen to appropriate music, consume inspired science fiction, and drink to the Large Hadron Collider and its success. If you’ve got a few hours (or weeks) of spare time, you could learn how to run the Large Hadron Collider, located at CERN in Switzerland. CERN published the full technical details of the collider and detectors online, and anyone with some curiosity and patience can read all 1,589 pages. Tell us if you got through all of it, and if you’re planning to make your own particle accelerator.